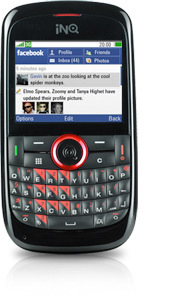 Back in August, I was pretty bullish when Hutchison-owned INQ announced the INQ Chat 3G, a follow-up to the INQ1, the company’s so-called Facebook phone. 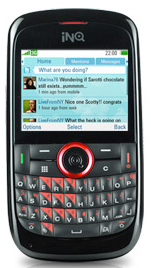 The updated device adopts a BlackBerry-esque form-factor in favor of the INQ1’s candybar, adding a full QWERTY keyboard to support a host of social messaging capabilities, including ‘push’ email (via Gmail), Facebook access, Instant Messaging through Windows Live Messenger, Skype, and a Twitter client that provides ‘always-on’ connectivity to the micro-messaging social network so that updates are pushed ’straight to the homescreen’. That’s a lot of functionality for a fairly low-cost device – it retails for £99 on a pre-pay (PAYG) tariff on 3UK – leading me to describe the INQ Chat 3G as taking aim at overpriced QWERTY touting smartphones. 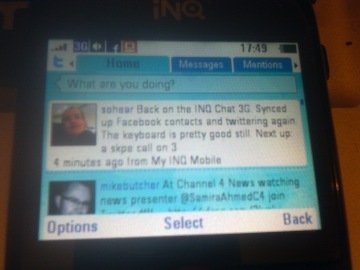 The INQ Chat 3G looks better in real life than the pictures do justice. Despite being (mostly) plastic, the phone has a glossy look to it and the silver trim down the side, along with the metallic painted back cover, adds a certain amount of style. And while nobody would likely buy the Chat 3G based on looks alone, I actually prefer it to some of the lower end BlackBerrys. The screen is reasonably bright too, and the navigation pad is nice and large, as is the surrounding function buttons. But with regards to hardware, it’s the keyboard which sets it apart from its predecessor. There’s plenty of travel and prominence to each key, and a definite click too. The phone’s software offers auto-suggestions in the form of a popup menu, and I found that with very little practice my typing speeds were on-par with similar portrait QWERTY phones, though not quite as fast as using Nokia’s E71/E72. On the downside, the space bar feels a lot stiffer than the other keys, although this may wear in over time, and I would have liked a dedicated @ key. That said, a long press and hold negates the need to use function to bring up symbols etc. Overall, I could certainly live with the INQ Chat 3G’s keyboard on a daily basis, which is saying something. Like the original INQ1, the Chat 3G’s 3.1 MP camera is nothing to write home about, it’s only really good enough for the most throw away use. Which, once again, is a shame considering how the phone integrates with Facebook, making sharing photos on the social networking site a breeze. There’s 3G (HSDPA 3.6 Mbp) but no WiFi, understandable considering the phone’s price point. There’s also charging and mass storage mode via miniUSB, and a microSD card slot. Oh and GPS too. It’s also worth mentioning that battery life is much improved over the INQ1. With push email, a few calls, light surfing, and a healthy sprinkling of Facebook/Twitter, you should be good for at least a full day, if not a little more. Once again, it’s the software where INQ hopes to distinguish itself from competing phones sold at similar or slightly higher price points. And coupled with 3’s support for Skype, for example, the proposition is pretty compelling. The UI is the same found on the INQ1, with the phone’s homescreen containing live widgets (weather, RSS feeds, Twitter etc. ), along with a carousel of app short cuts, not dissimilar to Mac OSX’s dock. New to the table however, is INQs Twitter app. It’s fair to say that the app itself is really nicely designed. As well as updating your Twitter status, along with viewing the updates of those you’re following, there’s support for @ replies and Direct Messaging. The latter are also pushed to the homescreen, just like an SMS, which proved really useful. But this is where things go a little downhill. After launching Twitter, the INQ Chat 3G routinely froze while downloading the updates of the 300 or so people I follow. Sometimes this would be for a minute or two and then normal use could resume, and other times the phone would actually reboot. It’s quite a serious issue that INQ needs to address as soon as possible in a firmware update, as a quick google suggests the problem isn’t unique. It’s a real shame because, as I said, the app itself, when working, is great. The second app I put through its paces was push email using my Gmail account. This was very easy to set up, requiring just a user name and password and I was good to go. There are also options for other common email providers, such as Hotmail, Yahoo etc. While the Facebook app is quite basic, often sending you off to the mobile website version, the address book integration we first saw in the INQ1 is really neat. It’s a feature that used to set INQ apart from most of the competition, but is now offered in some form by almost every other handset maker – Palm Synergy, HTC Sense etc. – and a number of carriers (Vodafone 360). INQ’s implementation still works well, enabling you to merge contacts that crop up in both Facebook and the phone’s address book/SIM card (and MSN, Skype – see below), although this has to be done manually. A degree of automation would save quite a bit of time setting up the Chat 3G’s social address book, but as this only really needs to be done once, it’s no deal breaker. Again the client is really well designed, integrating with the phone’s address book, including the ability to merge duplicate contacts across the various other services that the Chat 3G supports. There’s IM and calling, including SkypeOut for international calls – thanks to 3 – and both worked as you’d expect. Call quality wasn’t great, however, but easily passable for social calls. Finally, I tried browsing the web. And while full web pages rendered well, the experience was painstakingly slow. An alternative is to install Opera Mini, which I’m told works better. On paper, there’s a tremendous amount of value packed into the INQ Chat 3G and for the most common apps and social web services, the phone has you covered. The built-in apps replicate almost exactly how I’ve set up my day-to-day and much more expensive smartphone, Twitter, push email, Facebook, Skype etc., and in that sense, the Chat 3G fulfills its mission: bringing a social messaging QWERTY phone to the mass market. But, and it’s a big but, the Chat 3G often seems to be trying to punch a little bit too much above its weight. In places – particularly, Twitter and web browsing – it feels like the processing power can’t quite keep up with the phone’s software ambitions. Freezes and a general sluggishness let down an otherwise smart feature set and User Experience. Whether or not this can be improved through a firmware update, only time will tell.